Fiberpassion, which is composed of the two words fiber and passion. The passion we have dedicated ourselves. To dye fibers. Here, at Fiberpassion you will find exclusive hand-dyed wool and yarn from our own dye-studio. Precious yarn with yak, silk, kid mohair, cashmere, baby alpaca and fine merino wool. Also in our program you'll find ChiaoGoo knitting needles and accessoires, JUL design shawl stick and pins, closures, buckles, and more. If you need a currently out of stock color or a larger quantity than the ones available in our shop, please send me an email (handmade @ fiberpassion . de) or call me (+49 7251 308 5818). I'd love to dye a batch with your desired amount. When the colors explode around you, when the sun shines out from every face, you always meet people with joy and laugh at you from all corners. 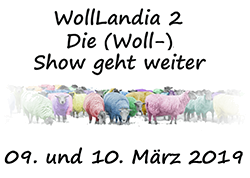 then you can "paint" with wool, because WollLandia is back. It didn't work out the last time: WollLandia. Because the both key players of Fiberpassion had to quit the service with a huge cold. For this reason, we have kept fit with vitamins and here we are, this time. In the past few weeks we have made great efforts to present our spring collection in Kieselbronn. You can look forward to what we have prepared for you. From Saturday 9th March until Sunday 10th March 2019 we offer you our precious yarns with yak, silk, kid mohair, cashmere, baby alpaca and fine merino wool, which you have to knit and crochet.